The original reason to use a local stratum proxy server is to be able to bridge some mining hardware designed to use the older getwork protocol to newer pools that use the better stratum protocol. An example of such devices are ASICminer’s Erupter Blade and Erupter Cube Bitcoin ASICs – these devices have a built-in miner software, however it uses the older getwork protocol and you would need to use a local stratum proxy in order to be able to set these devices to mine on a stratum-based BTC mining pool. Below you can find a link to download the Windows version of the stratum mining proxy, and here you can find the source code of the project. 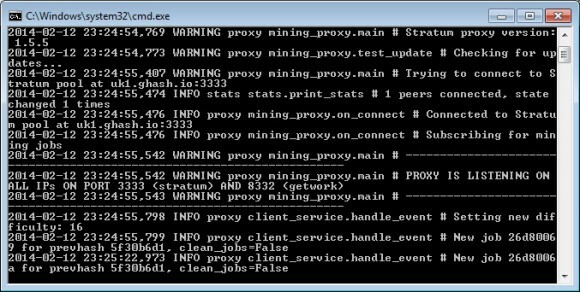 You can however also use the stratum proxy locally in order to easily control all of your miners at once, if you point the miner to the local proxy server you only need to change the pool that the proxy will connect to and all of the miners will be redirected to that pool, so no need to individually change them. The stratum proxy will work with both getwork and stratum miners and will connect them to stratum pool on the other side. The above example will run the stratum proxy server on the IP address of the system it is running on and it will start to listen on local ports 3333 (stratum) and 8332 (getwork) and the miners that connect to them locally will be getting work from the uk1.ghash.io mining pool that will be connected on port 3333 externally. That is all you have to do, it is quick and easy to configure and use the stratum mining proxy.